El año último, dos inspectores de la agencia de residuos peligrosos de California visitaban a una empresa de reciclaje de artefactos electrónicos cerca de Fresno para llevar a cabo una revisión rutinaria de documentos cuando se encontraron con un almacén, del tamaño de una cancha de fútbol, repleto de decenas de miles de viejos monitores de computadora y televisores. Las cajas de cartón que se desmoronaban, apiladas en filas tambaleantes de casi tres metros de altura y cuatro metros de profundidad, ocupaban tanto espacio que los inspectores necesitaron teléfonos celulares para comunicarse entre ellos. La capa de cristales rotos en el suelo y el polvo cargado de plomo en el aire eran tan densos que los inspectores pronto abandonaron el sitio debido a preocupaciones de seguridad. Semanas más tarde, el dueño de la empresa de reciclaje desapareció, abandonando los residuos, y dejando atrás un riesgo de toxicidad y un costoso trabajo de limpieza para el Estado y el propietario del almacén. Hasta hace pocos años, los monitores y los televisores rotos, como aquellos apilados en el almacén, se reciclaban de manera rentable. Los embudos grandes y vidriosos dentro de estas máquinas, conocidos como tubos de rayos catódicos (CRT, por su sigla en idioma inglés) eran fundidos y usados para hacer nuevos tubos. ON THE TRAIL Members of an environmental group worked with researchers from the Massachusetts Institute of Technology to place tracking devices in cathode ray tubes bound for American recycling companies. The crumbling cardboard boxes, stacked in teetering rows, 9 feet high and 14 feet deep, were so sprawling that the inspectors needed cellphones to keep track of each other. The layer of broken glass on the floor and the lead-laden dust in the air was so thick that the inspectors soon left over safety concerns. Weeks later, the owner of the recycling company disappeared, abandoning the waste, and leaving behind a toxic hazard and a costly cleanup for the state and the warehouse’s owner. Cathode ray tubes have been largely replaced by flat panels that use fluorescent lights with highly toxic mercury in them, said Jim Puckett, director of Basel Action Network, an environmental advocacy group. Used panel screens from LCD televisions and monitors, for example, do not have much recycling value, so many recyclers are sending them to landfills. State and federal environmental policies have also become victims of their own success. Over the past decade, environmental regulators have promoted “take-back” programs to persuade people to hand in the more than 200 million old televisions and broken computer monitors that Americans are thought to have stored away in closets, garages and basements. The same programs have courted businesses to divert their electronic waste away from landfills to avoid the hazardous chemicals in this toxic trash from leaching into groundwater. More than 290,000 tons of the high-tech castoffs are now directed away from landfills and toward recyclers each year. “The problem now is that the collection of this waste has never been higher, but demand for the glass that comes from it has never been lower,” said Neil Peters-Michaud, the chief executive of Cascade Asset Management, a recycling company. The stockpiling problem is especially worrisome to electronics companies and to state and federal officials since they might have to pick up part of the tab if the stockpiles were abandoned and declared federal Superfund sites. At least 22 states have laws that make electronics manufacturers like Sony, Toshiba and Apple financially responsible for recycling their old products. But lack of oversight of these programs has led to rampant fraud. In one tactic, quietly known in the industry as “paper transactions,” recyclers buy paperwork to indicate that they collected a certain amount of electronic waste that they never actually collected. The Obama administration, more than any of its predecessors, has strengthened oversight of electronic waste. In 2012, the General Services Administration enacted rules discouraging all agencies and federal contractors from disposing of it in landfills. The federal government, which is among the world’s largest producer of electronic waste, disposes more than 10,000 computers a week on average. Federal agencies are failing to sufficiently track their electronic waste, and large amounts of it are still being disposed of through public or online auctions, according to a Government Accountability Office report last year. In these auctions, the waste is often sold to a first layer of contractors who promise to handle it appropriately, only to have the most toxic portion subsequently sold to subcontractors who move it around as they wish. Some of this waste is dumped illegally in developing countries, the G.A.O. found. Congress is considering legislation to ban certain types of unprocessed and nonworking electronics and electronic waste from being exported to developing countries from the United States. Recyclers say there is still money to be made on processing the old monitors and televisions if companies charge a price that more genuinely reflects the expense of disposing of the glass properly. But practices like “greenwashing,” whereby companies pretend to engage in environmentally responsible disposal practices, hinder such progress. The sheer quantity of the glass accumulating at some recycling plants has contributed to environmental and workplace safety problems. In Yuma, Ariz., for example, Dlubak Glass, one of the country’s largest recyclers of glass from televisions and monitors, found itself overwhelmed. When state regulators visited the site in 2009, they found a mountain of the lead-rich glass, several stories tall. Dust from the shimmering mound of recycled glass had contaminated the surrounding soil, including a nearby orchard, with lead at 75 times the federal limit, according to state documents. “We have it entirely under control now,” said Herb Schall, a Dlubak plant manager. 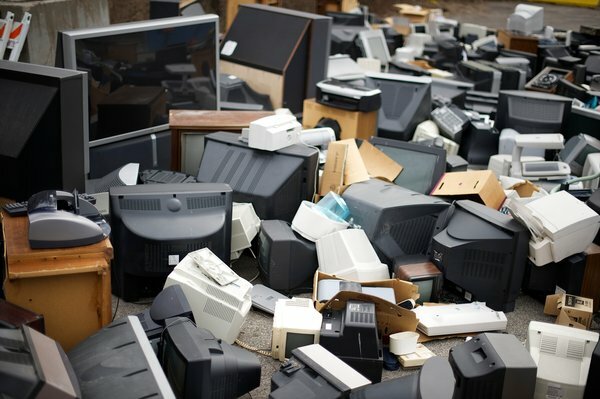 In September, California passed an emergency measure allowing companies to send monitors and televisions to hazardous landfills for the next two years. Charlotte Fadipe, a spokeswoman for the California Department of Toxic Substances Control, said her office’s investigation of the abandoned warehouse near Fresno is continuing, and investigators are still trying to locate Charles Li, the owner of the company, TRI Products. Over the past four years, TRI has been paid more than $1 million by the state to recycle electronic waste from local schools, hospitals and federal agencies, including the F.B.I., the I.R.S. and Immigration and Customs Enforcement, according to state and company documents. 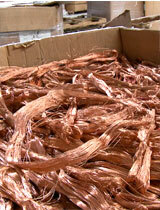 After a reporter found him to be running another electronic waste disposal company, Mr. Li did not respond. But when he was contacted online by another recycler and asked whether he was still looking to buy electronic waste, he immediately replied yes, with one caveat. A version of this article appeared in print on March 19, 2013, on page A1 of the New York edition with the headline: Unwanted Electronic Gear Rising in Toxic Piles. A group of women in Mexico is trying to improve the town’s economic situation by taking part in a bi-national effort to recycle television sets, computers and other electronics and the digital transition in the United States is working in their favor. The women live in the small community of Fronteras in the state of Sonora, south of Douglas, Arizona. The women formed a cooperative to achieve their goals and they have been so persistent and driven that they have been nicknamed in Spanish as “Las Chicas Bravas” or the “The Tough Women.” Tony Paniagua speaks with two of them as well as a couple of assistant volunteers and the president of a Vermont company that is a vital link in the recycling efforts. Tucson Clean and Beautiful recently was there to take a look at the operation and TVs collected in Arizona will be going to Fronteras, where they will be sold if in good condition in Mexico, or else be disassembled for materials like copper and lead. The digital transition in the United States means that thousands of analog televisions will be replaced and since Mexico is not going digital, the market for them is much better.